Lovely Local Flowers Are Greener! 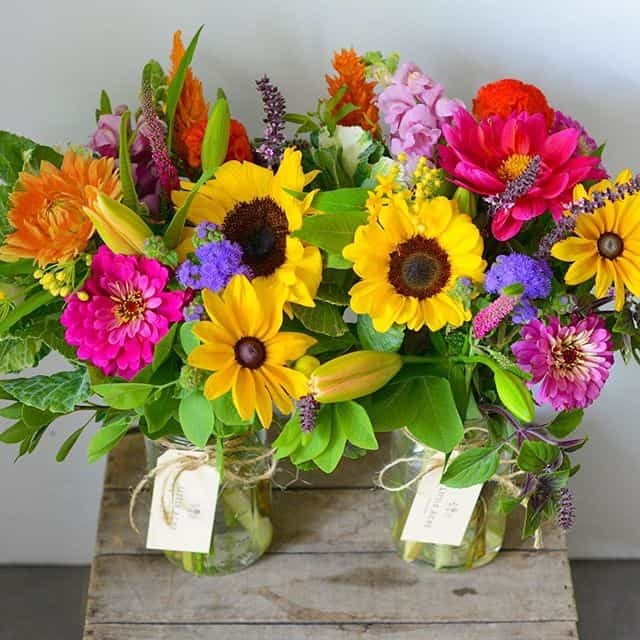 Who doesn’t love a bouquet of flowers for a special occasion or for no reason at all? I know I look forward to giving and receiving flowers but the last time I received a bouquet I, of course, questioned where they had come from, how much trash the packaging created and if there was a greener alternative. Could the answer be in local flowers? California is still America’s top cut flower producer but Colombia is the dominant produce for U.S. cut flowers, with Ecuador taking a close second. Combined, Colombia and Ecuador accounted for roughly 90% of all roses, 98% of all carnations, and 95% of all chrysanthemums sold in the U.S. last year. In addition, Holland’s vast wealth of cut flowers is still readily available in the U.S., accounting for almost 95% of all U.S. tulip imports. Since I don’t live near any of these places it takes a lot of traveling for the flowers that end up in my bouquet to get to me. All that travel requires lots of fuel and the use of natural resources. 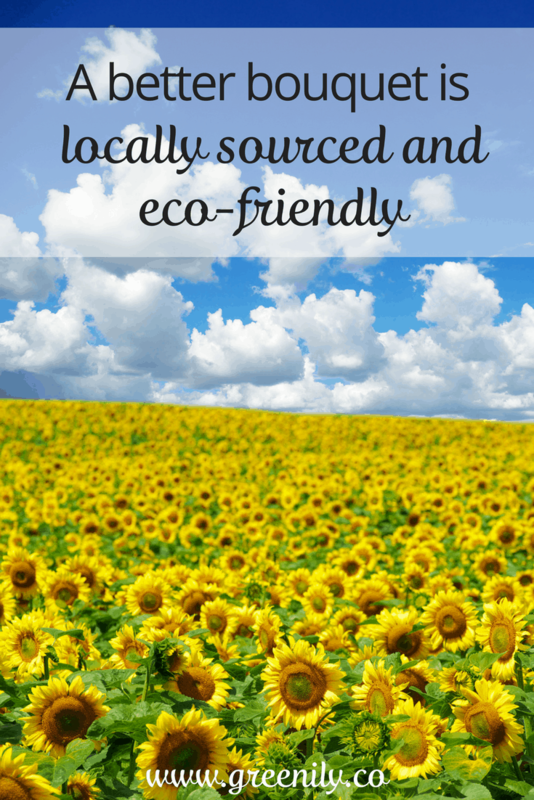 Local flowers are a much more eco-friendly alternative! They will have a lot fewer miles to travel to get to you therefore using far less natural resources. When I looked a little further into the cut flower industry I learned that, in additon to not being nearby and requiring the use of lots of energy to get them to me, that many flowers are not grown in a sustainable way. This could mean the use of harsh chemical fertilizers and toxic pesticides which are harmful to the environment and the local wildlife. Or that water use isn’t managed leading to water waste and over use. 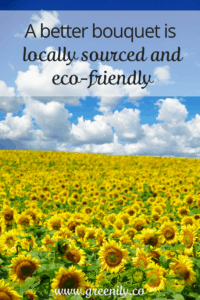 Local flowers that are grown using sustainable methods (no harmful fertilizers or pesticides) are much better for the environment – and can be found near you with a little bit of research! This aspect of having flowers delivered (or even buying from the store) makes me crazy! I HATE that after unwrapping and arranging my flowers that I am left with so much trash! There is the plastic wrap that can’t be recycled and has to go…into the trash. There is the elastic wrapped around the flowers that has to go…into the trash. And then there is that little packet of flower food (which is actually powdered citric acid, sugar and bleach) that has to go…into the trash! As an aside, the little packet of flower food helps prolong the life of the flowers by providing a source food and keeping unhealthy microorganisms at bay. 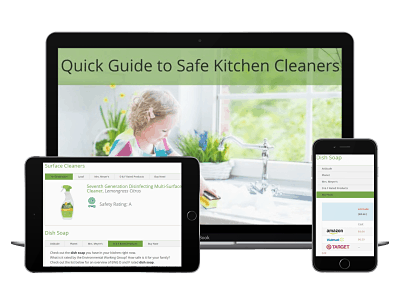 You can make your own by combining 1 teaspoon sugar, 1 teaspoon household (non-chlorine is more eco-friendly!) bleach, 2 teaspoons lemon or lime juice and 1 quart lukewarm water. After learning all about how un-environmentally friendly flower delivery can be I had to find an alternative. It had to be a local company (to save energy) and it had to be sustainable (to be friendly to the environment). 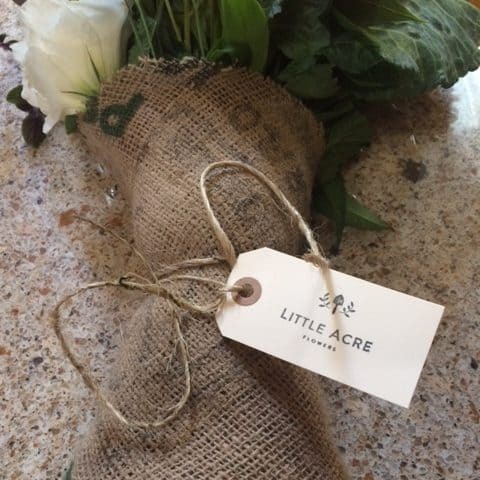 So, I was thrilled when I came across Little Flower Acres! 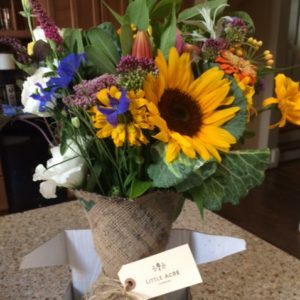 They are a local company that gets its sustainably grown flowers from local farms. Their flowers arrive in either an American made mason jar (that you can reuse or drop off for recycling) or hand-tied in a repurposed, burlap coffee sack from a local Mayorga coffee shop. I was SO, SO, SO thrilled with the bouquet I received!!! It was gorgeous! It smelled beautiful! The flowers were so colorful and the greens added such a nice touch! It really felt like I had just run through a field of flowers, gathered up a bunch and created a bouquet of lovely local flowers – only I have zero talent for flower arranging and the artists at Little Acre Flowers had done all the amazing work!